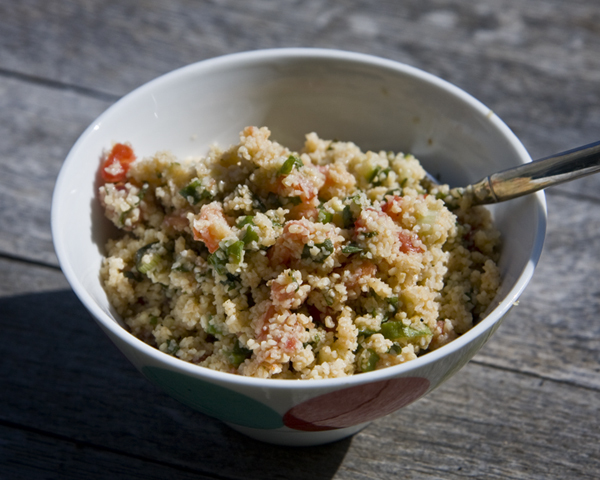 Some people make tabbouleh with couscous, but I prefer the texture of fine ground bulgar, so I created this tabbouleh recipe with bulgur to suit my tastes. Some people use fresh parsley and coriander, but for me, plenty of fresh mint alone is the best! Mix together the bulgur and the boiling water in a large bowl, and let it sit for 10 minutes or so. If you’re not using fine grind bulgur, you may need to adjust the water/grain ratio and sitting time. Add the spring onions, cucumber, tomato, and mint. Mix to combine it, then add the rest of the ingredients, one at a time, stirring after each addition. Chill it, then fluff it before serving. Looks delicious. I’ll give this one a go this weekend or tonight.